Well that big engine didn’t fare so well in competition, detonating itself after one lap. So, for the 1908 races, Isotta tried something different. Instead of brute power via displacement, they went for the whole package. The cars were light and handled well – weight was only 1,342 pounds – which is probably close to what the 17.2-liter engine weighed. And then they fitted it with a light 1.2-liter straight-four. They were more successful at the track and Isotta Fraschini built some for the road and dubbed them “FENC.” The engine was enlarged to 1.3-liters and makes about 17 horsepower. It is capable of 60 mph. You could call it a sports car. Only about 100 FENCs were built and only two are known to survive. This one was discovered in 1985 in bad shape and then thoroughly restored. It sold at auction in 2008 for $166,500. We’ll see how it goes this time around. Click here for more info and here for more from Mecum in Monterey. 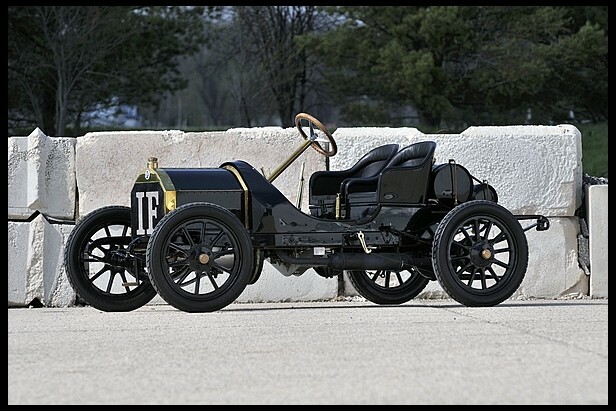 This entry was posted in Uncategorized and tagged 1908, auctions, cars, classic cars, isotta fraschini, mecum, tipo fenc, two-seater by classiccarweekly. Bookmark the permalink.